The sun was slowly going down the horizon when we reached Narooma, on an Easter Saturday, a good 350 km from Sydney. 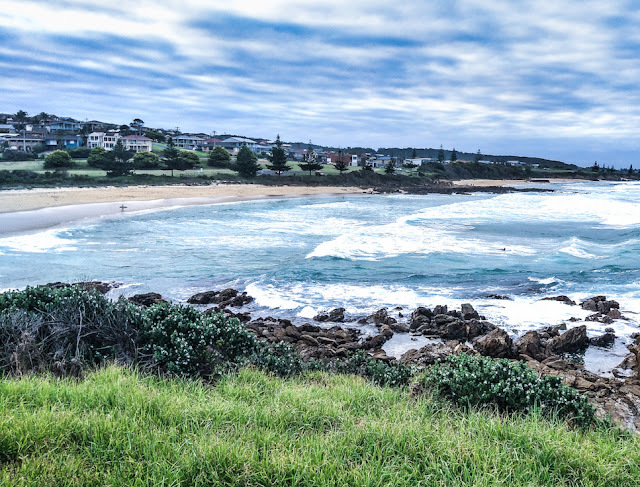 Narooma is a gorgeous coastal town in the State of NSW, Australia. A dreamy locale, where every winding road is flanked by beautiful sights, charming its way into your heart. But, the beginning of our holiday wasn't a smooth one. On reaching the hotel that was booked for our stay, we were told that they never received our booking-order. Even though at that point we were holding a confirmation receipt, the hotel didn't have any record of our names or number. It must have been a glitch on the booking website. Unfortunately, the hotel was already booked out so they couldn't provide us with any other room, but the kind owner called up other hotels to check if they had any room available. Luckily, even on a busy long weekend, we found a room just across the road. And so after a hiccup, we began our two days of fabulous holiday. On the first day, we roamed around the breakwater, exploring places on both the side of Narooma Bridge. 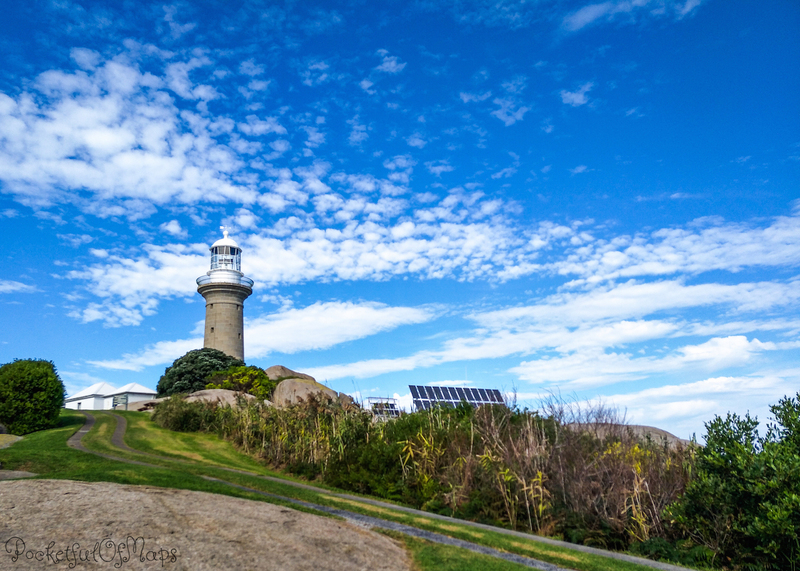 On day 2, we sailed to Montague Island and enjoyed a guided tour of the island, before heading back home. 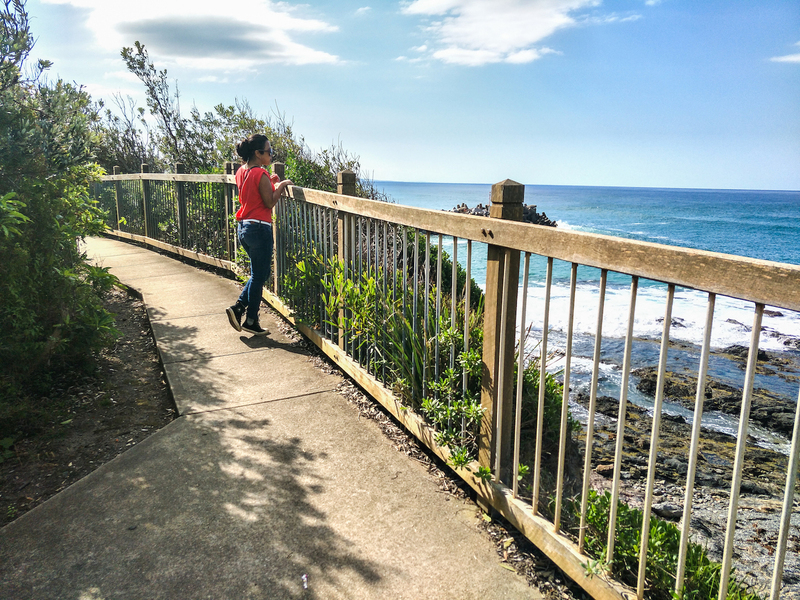 This 800m long board walk provides a spectacular view of the waterside. The water is so clear that you can see scores of marine life swimming beneath. Here's a picture of a school of fish, shaped like a fish. I was fascinated by the different species of fish that I could spot so easily. No wonder this is a popular location for fishing. I was walking on the rocky path, along the waterside, when I happen to look down. Surprise surprise!! 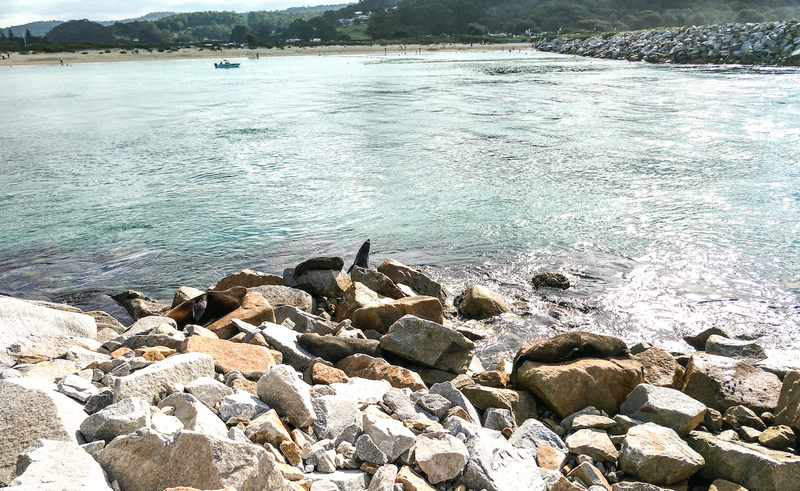 there was a pod of seals basking in the sun. That was a delightful sight and totally unexpected. I had never seen seals in their natural habitat before. They were so close that I could actually hop down and pat them (not advisable though :)). It was amazing to see these lovely creatures, sharing a space of nature with us. The shore near Mill Bay Board Walk is popular for Sting Ray feeding, where they compete with the seagulls for a piece of fish. Can you spot just a hint of Sting Ray in the below picture? Their wing span is pretty impressive but look quite sinister when viewed from the top. We hired a canoe from Narooma Marina and went canoeing in the beautiful waters of Wagonga Inlet. I am not a good swimmer. I can barely survive in a swimming pool, so the thought of being in the middle of a massive waterbody was actually terrifying, which was why I didn't opt for a Kayak. Canoe looked like a safer option as husband could man it pretty well. The wind wasn't strong that day and the afternoon sun was covered by grey clouds. We rowed for an hour, surrounded by the serene beauty of Narooma, listening to the sound of waves. It is an experience which I will always remember. A rock in the shape of the map of Australia - how ridiculously cool is that? We went to visit this place in the daytime, but later came to know that one can see beautiful sunrise from this spot. We hired a ferry to Montague Island early in the morning. It is advisable to book the tickets in advance, specially during holidays. The ferry took about 20 minutes to reach the Island, where our group was given a tour by an extremely energetic and knowledgeable guide, who also is an employee there and lives on the island. The view of the wide open sea was incredible. 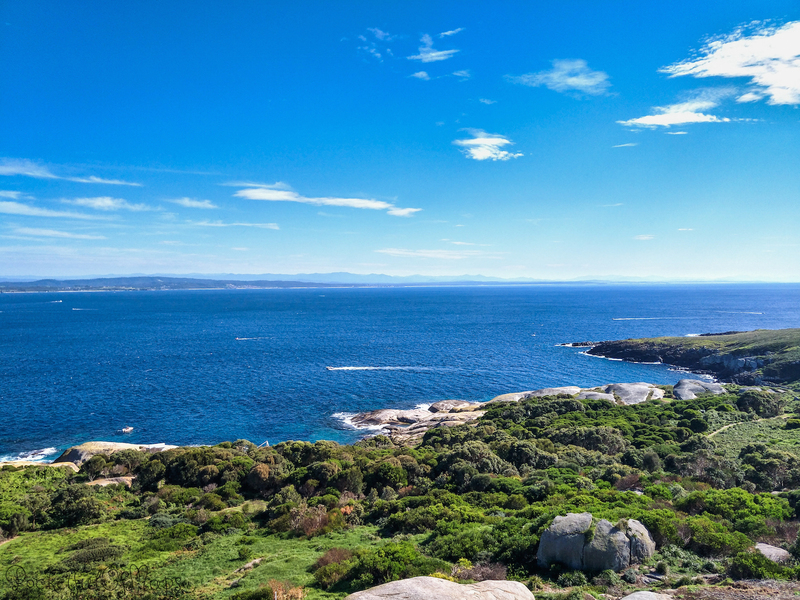 Montague Island is not only culturally rich, but also boasts of diversity in flora and fauna. The guide told us that during the annual whale migration season, he can spot from the island hundreds of whales swimming across. The seals have made these rocks their home, along with atleast 90 species of birds. The lighthouse was built in 1881 and still proudly stands tall. We walked up to the top of lighthouse, and outside as well, where you get a magnificent view of the island and can also feel how strong the wind is up there. 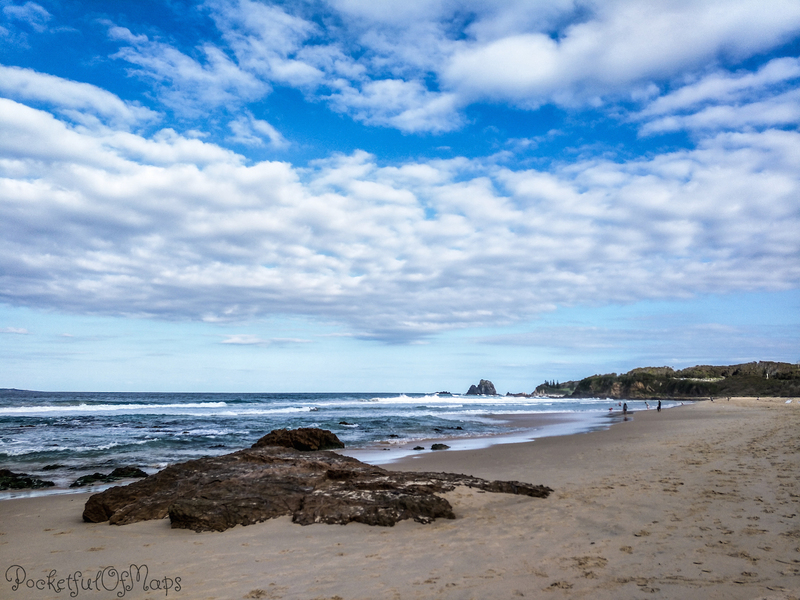 The beaches in Narooma have gorgeous white sand, extremely soft that make 'khop khop' noise when you walk on them. I know that's a really bad attempt to describe that sound. Since it was Autumn and the weather quite cold, I didn't step into the water, but walked along the shoreline, feeling the breeze and collecting white shells. Afar you can see another famous rock formation called Camel Rock. I spent two beautiful and relaxing days in Narooma. A lot still remains to be explored, which is good as I will have more reasons to visit this charming suburb. That sounds like such an idyllic vacation. I need such calming, rejuvenating vacations in my life. 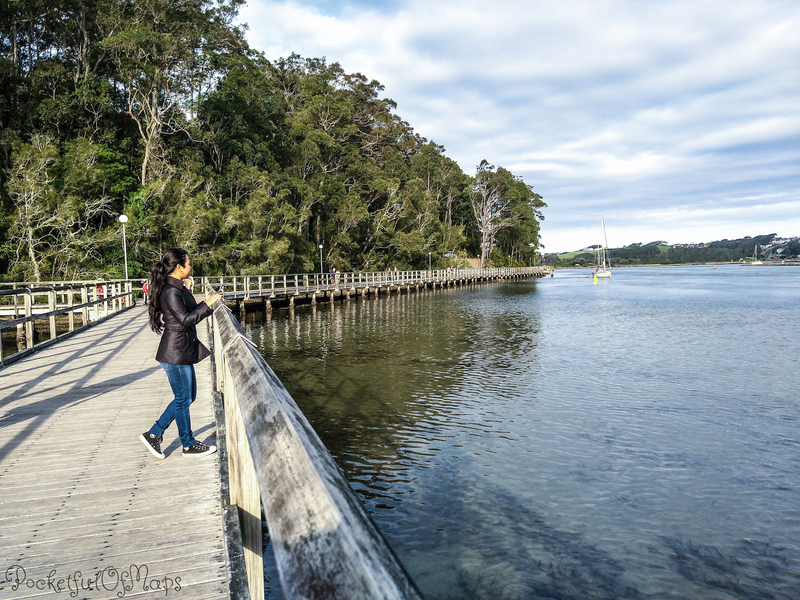 Narooma looks like a perfect stop in the Sydney area. It's so much fun spotting wildlife unexpected. I guess I'd go back for the sunrise at the Australia rock. That's such a cool spot! Great share! Bookmarking this for our future Australia trip! Wow! The pictures are awesome. I hope I could get to experience this amazing place. What a beautiful place to explore! I always try to get out on the water any time I visit a new place - canoe, kayak, boat tour, etc. I love the different perspective! Wow! I had never even heard of this place before this post. It looks like such a relaxing beach town. And I am so sorry about your hotel booking. Annoying but so glad they had an extra room for you! Wow?!! Those are some absolutely cool things to be doing on your vacation :) Sounds like a place I'd love. I always loved your pictures. So much beauty in all of them. The vacation spot looks like a perfect one. That Australia rock looks so adorable! And the color of the sky and the water and the clouds! Wow, wow, wow! These are such great tips! 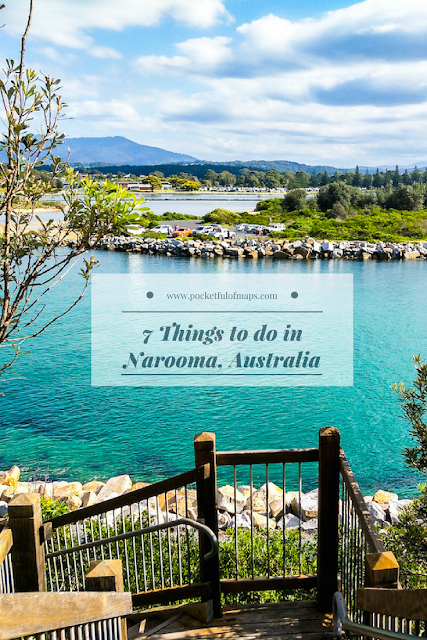 I've never even heard of Narooma before, and now it's on my Aussie bucket list. I LOVE that Australia Rock! 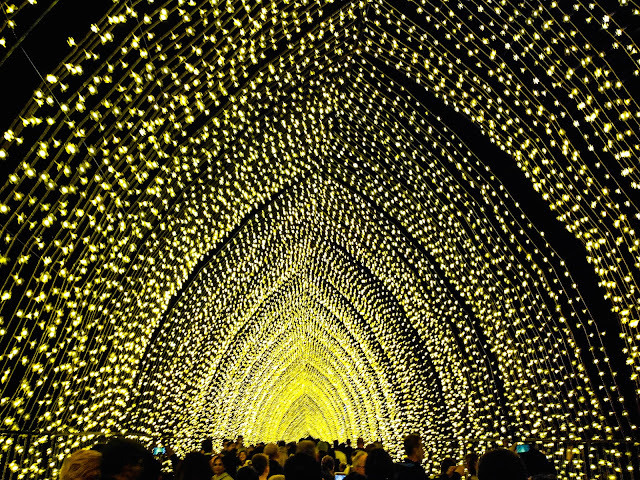 I love exploring Oz through your eyes and the pics here are just gorgeous- what lovely places you get to explore - I am ever so envious Raj!!! What a splendid place! I love kayaking. It's the one thing I can do with reasonable bravery ;) Those seals look cute! Yeah I wouldn't pet them either though. How fortunate that you got another room on short notice! So glad for you. Your photos are beautiful! I truly cannot wait to head to Australia - it seems there coastlines are second to none! Your photos look absolutely breathtaking and postcard worthy. I would love to visit Australia as a whole one day. Never heard of this city before. I adding new places to visit in Australia! It looks absolutely beautiful & your photos are lovely! Thank you for the detailed info. 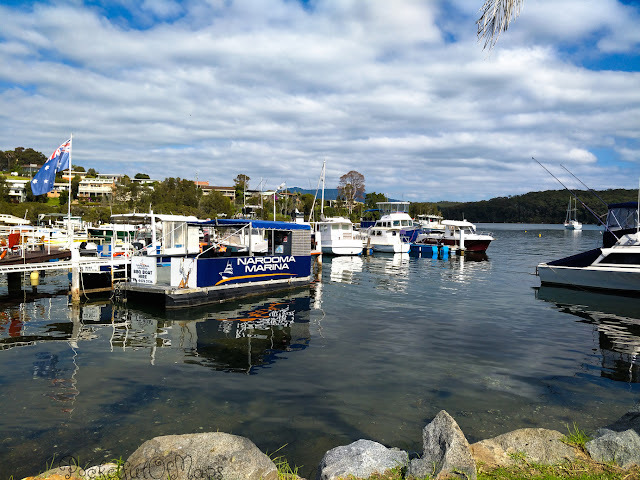 Narooma seems like a great destination! What time of the year would you suggest visiting it? I've never heard of Narooma, but it looks gorgeous! I love canoeing, so I'd definitely need to try that out if I ever go there. The Australia Rock looks really cool too. 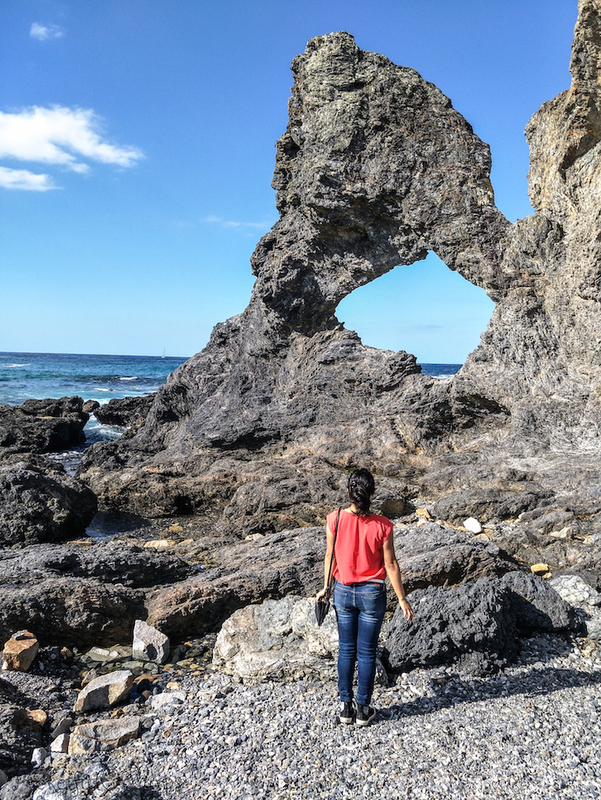 I love finding rock formations like that. 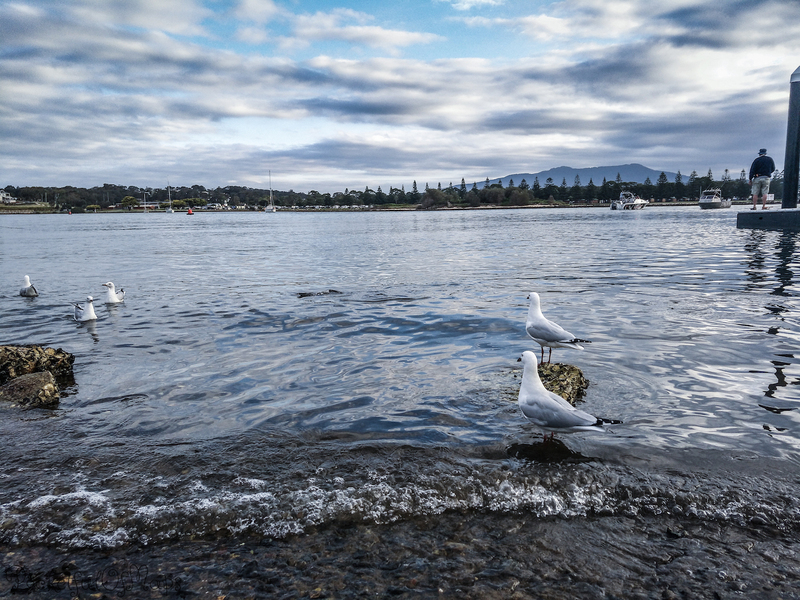 What a gorgeous place Narooma is and more so through your words and spectacular pictures!